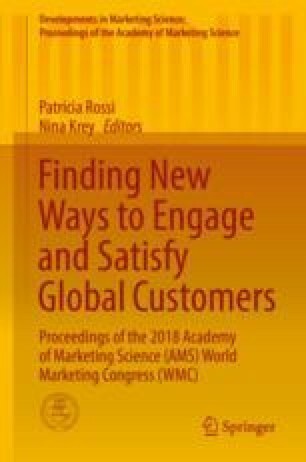 Recent marketing studies highlight the increasing cultural diversity around the world, whether in terms of consumer demography, brandscapes and product flows, transnational imagined communities, or lived realities in given places (Cayla and Eckhardt 2008; Demangeot et al. 2015). The unprecedented cultural heterogeneity and interconnectedness of global markets point to a need to understand what occurs when cultures meet, sometimes aligning and in other instances colliding with one another. More specifically, how consumers and marketers culturally identify and adapt to or resist cultural “others” and the resulting impacts on meanings, perceptions, choices, and strategies form critical knowledge gaps (Izberk-Bilgin 2012). Consistent with the 2018 AMS World Marketing Congress theme of “Finding New Ways to Engage and Satisfy Customers,” we present a special session to explore cultural identity and adaptation in global marketplaces. The conference recognizes that global forces are bringing divergent cultures together, creating challenges and opportunities to find and reach new customers. We assemble four presentations, followed by discussions, offering critical methodological, conceptual, and empirical insights on cultural identity and adaptation in the global context: “Consumer Multicultural Identity Affiliation: A Framework for Segmentation in Multicultural Markets” by Eva Kipnis, Catherine Demangeot, and Chris Pullig; “Mono-ethnic Marketing Communications: Enhancing Ethnic Congruence or Manipulative Intent?” by Charles Chi Cui and Tana Cristina Licsandru; “The Acculturation of Firms in a Global Setting” by Cheryl Nakata; and “Acculturation, Enculturation, and Belongingness as Predictors of Ethnic Consumption Choices: Conceptualization and Model Testing” by Tana Licsandru and Charles Chi Cui.